You bet. 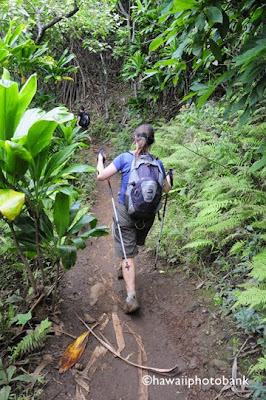 With some 13 trailheads (many with multiple trails) into the Ko'olau Mountains directly above greater Honolulu, heavily populated Oahu, ironically, has the best system of state-run Na Ala Hele ("trails for walking") in the Islands. Another dozen Na Ala Hele, or state park, trails are on Windward side of the Ko'olaus and also on the Wainae Range is west Oahu. 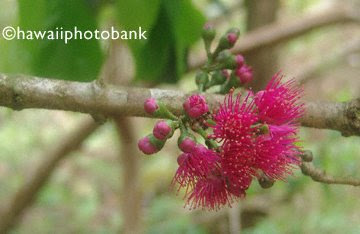 Native vegetation still grows along the sharp ridges, like the red-flowered Ohia. Some of these trails are a serious adventure, using hands and the ocassional rope, trying to avoid near-vertical drop-offs (though not a problem for the careful trekker). In Lyon Arboretum (pictured) in Manoa Valley, the trim garden paths give way to a more jungly streamside hike.